Researchers at Duke University have developed a new technique for improving the accuracy of gene edits made using the CRISPR-Cas9 gene editing tool. 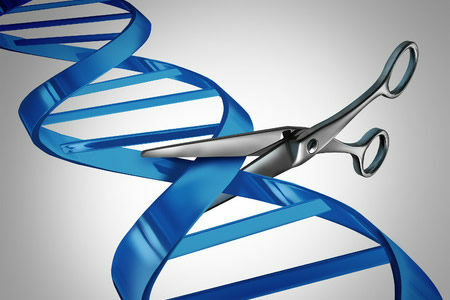 CRISPR-Cas9 has been shown to be highly accurate, although some off-target effects have been observed in some studies. While those unintended edits may not prove harmful, if used in patients they could end up causing complications far worse than the disease they are used to treat. The CRISPR-cas9 system relies on guide RNA (gRNA) which binds to a specific section of DNA, after which the Cas9 enzyme component makes the cut in the appropriate place. In theory, the gRNA would only bind to the target site. However, the gRNA, which is around 20 nucleotides long, occasionally binds to a section of DNA which does not exactly match the target sequence and differs by a couple of nucleotides. In such cases, the cut is made in the wrong place. To ensure patient safety, the system needs further refinement to improve the specificity of gene edits. The Duke University researchers believe they have devised a solution. In their experiments, the accuracy of gene edits has been improved by an average of 50-fold. The Duke University researchers used a 20-nucleotide hairpin secondary structure which is incorporated into the spacer region of single guide RNAs and locks the gRNA and prevents it from binding to sections of DNA that differ slightly from the target sequence. When the gDNA encounters the correct section of DNA, the lock is broken and the gRNA binds. The researchers have tweaked the strength of the bond so that it can be unlocked when it meets the exact sequence of DNA that matches, but not if that sequence differs by a few nucleotides. To test the new system the researchers used the gRNA with five different CRISPR systems taken from different bacterial strains. On average there was a 50-fold improvement in accuracy, although with one strain the accuracy was improved 200-fold. While the idea behind the technique is relatively simple and was shown to be effective, it has taken several years of study to demonstrate that it was working exactly as it should. The researchers are now conducting further studies on other CRISPR systems. The plan is to test the technique on as many different CRISPR systems as possible and complete and in-depth characterization of the locking mechanism and how well it works in different CRISPR variants. The technique will also be used in an animal model of disease in the near future.